Stand Up to Cancer Scientist, Dr Chris Bakal and his team study cancer cells’ ability to shape-shift. 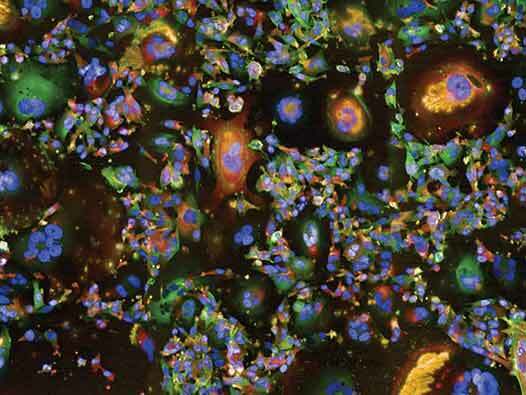 This crafty trick enables cancer cells to spread around the body. In this image you can see the shape changing capacity in action. All the cells in this image are clones of one single breast cancer cell, but look at the incredible differences between them! Rather than a spider bite or extra-terrestrial origins – it’s faulty genetic instructions that give cancer cells the morphing powers that result in this incredible diversity. Chris and team hope to find new drugs that can act like a molecular freeze ray, trapping cancer cells in one shape and ridding them of their ability to move! Ultimately, this could make them much easier to destroy. Want to learn more? Watch Joe Sugg and contortionist Pixie Le Knot show how this killer science could save lives. Video of What happens when Joe Sugg meets contortionist Pixie Le Knot?